Russian-American wedding and party entertainment: Russian dancers, Caucasus, Gypsy, Ukrainian, Jewish comedy, bellydancers, circus, costumed characters, ballet dancers, can-can, violinists, accordion players, jazz, singers, DJ, MC, one-man-band, models. 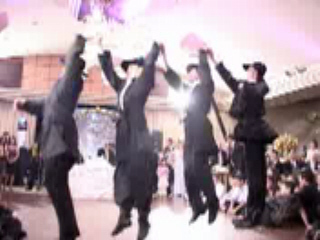 DJ Alisa for kid's parties, bar/bat mitzvahs in New York City, New Jersey and Connecticut. Female Russian DJ Natasha Korolyova - professional DJ services for private and corporate events in NYC,NY,NJ,PA,CT, and other states. MC Vlad is available for hire in Brooklyn, New York and Los Angeles, California. MC Vladimir - Russian master of ceremonies from Chicago, Illinois. MC Misha - Russian-American master of ceremonies from North Jersey. Russian singer Marina Zhuravleva from Calgary, Canada. Russian singer Elena Harris from Grand Forks, Idaho, USA. Russian wedding officiant Mikhail - bilingual contemporary interfaith wedding minister is available for hire in New York, New Jersey, Connecticut, Pensylvania and other states. All types of ceremonies - civil, interfaith, intercultural, religious, non-denominational, spiritual for all type of venues, park/beach weddings. All faiths welcome. Interfaith Wedding Minister Valentina - Russian Wedding Officiant from New York City. Oleg Sorin - trumpet player from Toronto, Canada. Hip Hop R&B Duo "Style" - (Patrice Hawthorne and Devon Lassiter) - from Philadelphia, Pennsylvania. Female Acrobatic Trio is available for cruise ships, casinos, all kind of private and corporate events, restaurants, clubs, and festivals. Female Acrobatic Trio can perform on all platforms at any ceiling height. Alex Brooks - facepainting, circus magic show for kids' parties in San Francisco, California. Bubble Acrobats Contortionists for hire in New York City, New York, New Jersey, CT, PA, and other states. Andrey - Clown and circus artist. Available for Kids Entertainment and Birthday patries in Brooklyn, Queens, Manhattan, Staten Island, The Bronx, Westchester County, Long Island, New York, New Jersey, Connecticut and Pennsylvania. Clown Arkadiy is performing with his trained dog for Kid's parties, other private and corporate events in New York City, Brooklyn, Staten Island, The Bronx, Queens, Long Island, some parts of CT, NJ, PA and other states. 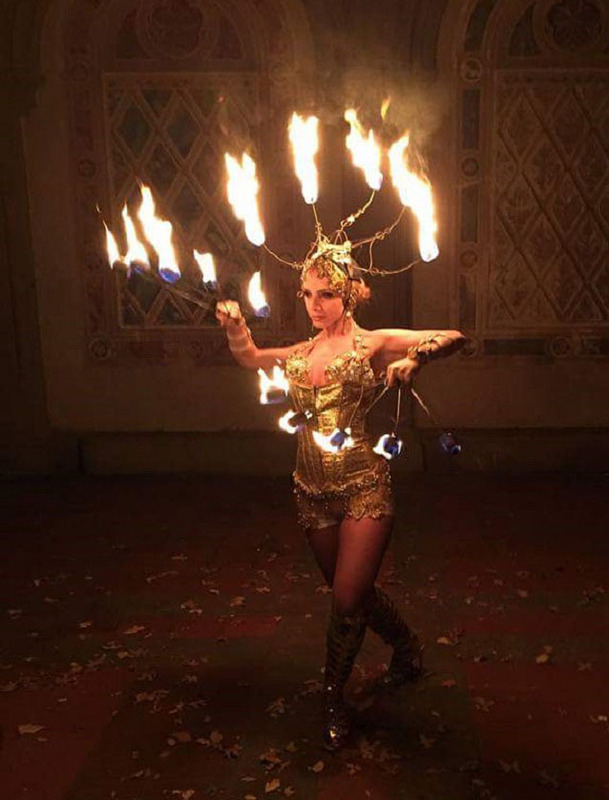 Fire show NYC - fire eater, fire breather from New York City is available for hire in New Jersey, Connectucut, Pennsylvania and NY. New York Circus Entertainment - martial arts, fire breathing, yoga, children's entertainment, juggling, stilt walking, circus Workshops, unicycling. Stage shows, side shows, roving entertainment, and customized performances by Fiodor. Gina DeFreitas - aerial silks artist from New York. LED and fire shows by Andrey from NYC for adult care centers, kid's parties, private and corporate events in Brooklyn, Queens, Manhattan, Staten Island, The Bronx, Westchester county, Long Island, New York, New Jersey, Connecticut, Pennsylvania. Ded Moroz and Snegurochka - (Russian Santa and the Snow Maiden) for hire in NY, NJ, CT, PA.
NYC BEST DANCE SHOW - Unique Guest Greeters, Custom Choreography, All Kind of Events in New York, Connecticut, New Jersey, PA, and other states. NYC Burlesque dancer K from New York City is available for private and corporate events, festivals, music videos, parties, restaurants, clubs in NY, NJ, CT, PA, and other states. NYC SAMBA DANCERS for private or corporate events in New York City, Brooklyn, Queens, The Bronx, Staten Island, Long Island, Westchester County, upstate New York, New Jersey, Pennsylvania & Connecticut. NYC Flamenco dancer - New York based Flamenco dance show by Anna. Ziva - belly Dancer from Central Pennsylvania. Available in NYC, Frederick, MD, Baltimore, MD, Washington, D.C., Alexandria, VA, and Philadelphia, PA.
Ukrainian dance company Ukrainian Cossack dancers USA founded in New York by Ukrainian choreographer, teacher and dancer Andrij Cybyk in 2007. Domra and bayan duo "Chicago Cossacks" from Chicago, IL. 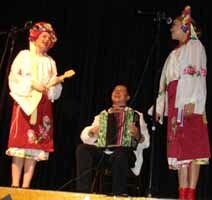 Cossack song, music and dance trio from New York founded by dancer and singer Valentina Kvasova, singer Victoria Pichurova and bayan virtuoso Victor Danilochkin in 2007. Ensemble performs Cossack folk music, songs and dances. All members of the group are highly trained in former USSR performers. Dance Ensemble "The Russian Collection" from San Francisco, California provides a selection of thrilling and colorful Russian folk dancing, enchanting Russian folk music, and Russian magical illusions. Group was founded in 1945 and has performed in Europe, Asia, North and South America. Russian dance ensemble from Toronto Canada "Revival" is available in Canada and the United States of America to provide live entertainment for corporate events, parties, weddings, and all other events. Artistic Director Ekaterina Kornienkova. Russian, Moldovan, Ukrainian, Gypsy and Jewish Folk dance ensemble "Canary"
Russian, Cossacks, Ukrainian and Gypsy dances, music and songs. Authentic instruments: garmoshka, balalaika, gusli. Different set of costumes for each dance. Russian traditional dance and music program NY, NJ, CT, PA, MD designed for smaller budget venues with limites space for the dancing. 3 dancers, 1 musician perform Russian, Cossack, Ukrainian, Siberian folk dances, songs and music. 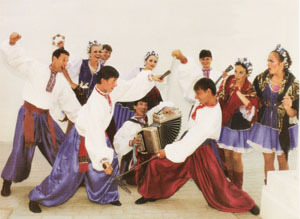 RUSSIAN BAND specialty is Gypsy, Ukrainian, Russian music and songs. All RUSSIAN BAND members are top professionals with many years of experience. Choice of Gypsy, Ukrainian, Russian (2 different sets) and Cossack costumes. Extended repertoire. Formal concert, background music or music for dancing party. Our main instruments are balalaika, domra, drums, garmoshka, Gypsy guitar, classic guitar, contrabass balalaika, cello and vocals. Travel with own pro-quality sound system. 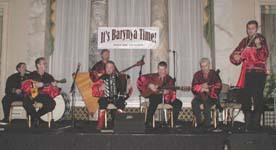 Russian folk music and dance ensemble Barynya from New York (since 1991). Russian, Gypsy, Cossack, Ukrainian and Klezmer traditional dances, folk and popular songs, virtuoso performances on musical instruments with humorous explanation of the program in English. Russian Balalaika Band The Balalaika Russe. New York, New Jersey, Pennsylvania, Connecticut. World Music Ensemble "The Internationals" from Chicago, Illinois plays Russian, Italian, Jewish, Ukrainian, Cossack, Gypsy, American oldies, and classical music from all around the world. Flexible structure depending on the clients' needs. 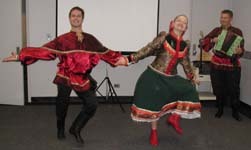 Russian Dance & Music Duo from New York performes in traditional costumes. Repertoire of songs, music and dances performed by professional musicians and dancers. Affordable Russian Dance & Music Duo is available for arts in education programs, concerts, convention promotions, media appearances, private parties, special events, theme engagements, weddings, etc. Piques Dames - Russian singers from New York City is a group of talented, classically trained musicians that perform in the New York metropolitan area at musical festivals, weddings, radio shows private and corporate events. Their repertoire includes a variety of Slavic and European Classical and Folk vocal music as well as compositions from operatic and sacred classics. Alexander Menshikov is a professional Russian Gypsy singer, vocal teacher, musician and performer with many years of experience. 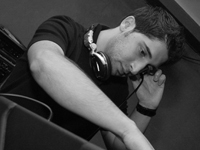 He can perform with band as background music or as main show for a Wedding, B-day or Corporate party. Alexander studied singing in The Gnesin's Academy of Russian music in Moscow. Currently based in Cliffside Park, New Jersey. Russian singer, Bass-baritone Alexander Prokhorov from Boston, Massachusetts was born in Russia. Now he lives in Boston, where he is engaged as one of the performing artists with Boston University's Opera Institute. Alexander has been described as a "true deep bass with tones, that immediately astonished with their midnight-dark, chasm depth of richness and powerful timber... a fine singer who has a fluid, musical legato that expressed the music's message with drama and excitement..."
Russian singer (bass-barytone) Boris Kletinich from Montreal, Canada was graduated from the University of Theater Art and Film of Moscow (Russia). During his military service, he was soloist of the Air Force Orchestra and Chorus of the Red Army. From the age of 19 years, competing with singers of 21 countries, he won the Grand Prix in the International Competition of the military songs. Boris can sing different musical forms: Russian popular and love songs, rock and love ballad, the jazz, the popular writings of Broadway, the Jewish and Latin America songs, arias of opera. Twix - show group from Moscow, Russia. Lina Karokhina - balalaika virtuoso from Boston, MA. Alex Siniavski - balalaika virtuoso from Philadelphia, Pennsylvania. Sergey Vashchenko - balalaika virtuoso from Austin, TX. Lev Zabeginsky - balalaika player from New York City. Leonid Bruk - contrabass-balalaika player from Brooklyn, New York. Simon Lemberskiy - balalaika player from Brooklyn, New York. Sasha (Alexander) Ressetar - balalaika player from Harrisburg, PA.
Anna Mikhaylenko - dancer and choreographer from New York City. Alexey Maltsev from Staten Island, New York. Aleksey Klyuchnikov- Russian dancer from Staten Island, New York. 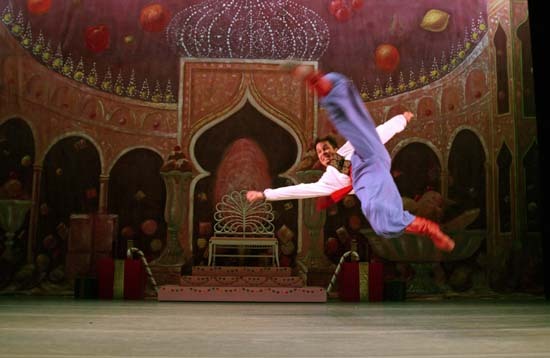 Alexander Rudoy - dancer, dance instructor from Brooklyn, NY. Aliaksandr Anatska from Brooklyn, New York. Anna Brovkina from Voronezh, Russia. 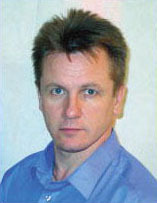 Ilia Streltsov from New York, NY. Petr Tikhonov from Brooklyn, New York. Danila Sherstobitov from Brooklyn, New York. Vasiliy Myshletsov - dancer from New York. Stanislav Issaev (Russian: Станислав Исаев) ballet dancer, teacher, choreographer. "Egrisi" - Georgian youth folkloric ballet was founded in Tbilisi, Georgia in 1995. The full cast can include up to 90 dancers, musicians and singers. Nikolai - bayan virtuoso from New York. Olena Malinina - Russian ballet dancer from Montreal, Canada. Natia Rtveliashvili - ballerina from New York City. Jessica - ballet dancer from New Jersey. Elizabeth - classical ballet dancer from New York. Lika - professional ballet dancer and teacher from Brooklyn, New York. Ukrainian Cossack dancers USA from New York City. "Pearls of Odessa/a>" - Children Chorus from Odessa, Ukraine. Roman Lewkowicz - dancer from New York. Lev Iwashko - Ukrainian dancer from Baltimore, Maryland. Nina Tritenichenko - singer, musician. Andrij Cybyk - dancer, teacher, choreographer. Yaroslaw Dobriansky - dancer from New York. Ksenya Hentisz - Ukrainian dancer. Bandura - Ukrainian folk instrument.